We can also add an icon linking out to your Instagram account your template layout. This is something that we would need to do for you at a low cost. Please contact us if you would like to set up this feature on your website. Their Instagram link is at the bottom of the website template. Have you noticed lately that the young 'uns are not on Facebook so often any more? It seems that the Facebook demographic has become older, and that younger people are now using Instagram a lot. It is a good idea if you want your business to be noticed to have a Facebook page for your business and also an Instagram account. Instagram is designed to be uploaded to and accessed by smart phones. It can be more convenient though to run your Instagram account from your PC you can using Bluestacks. Once you have set up your Instagram account and added some photos and comments you will need to link to your Instagram account from your website. You can do this yourself by adding a link on your Contact page. 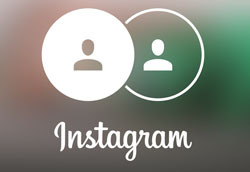 Free instagram icons of various sizes and colour schemes can be easily found via Google, or you can download and use this one (right mouse click and 'save as').